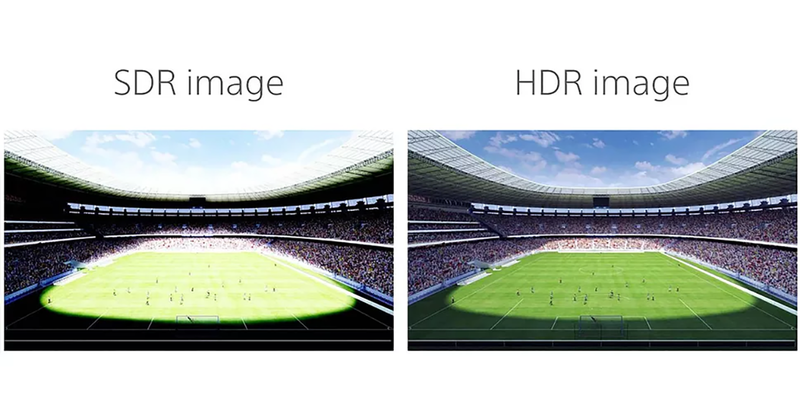 For me, high dynamic range (HDR) video is a much more exciting development than 3D or resolutions greater than 4K. When properly filmed, graded, and viewed on an HDR monitor, viewing so much detail in the highlights of HDR video is a visual treat. The best part about HDR content is that the workflow doesn’t need to be overly complicated, thanks to the implementation of the Hybrid Log Gamma (HLG) that was codeveloped by the BBC in the U.K. and NHK in Japan. HLG is available on the Sony FS5, AX700, Z150, PXW-Z90, and HXR-NX80; and on the Panasonic GH5. HLG isn’t perfect, nor is it the best gamma curve for all productions. HDR video filmed using SLOG3, professionally graded, and exported twice—once for HDR and once for SDR—can look better. But the benefit of using HLG is that you can use one video signal to support both HDR and SDR live, without having to grade or use LUTs. Currently, over 400 HDTV and UHDTV models support HLG playback, along with select projectors, Google’s Android TV platform, and YouTube. Sooner or later, you might be asked to produce a live event with an HDR viewing option, and this primer on HLG workflows is a good place to start. 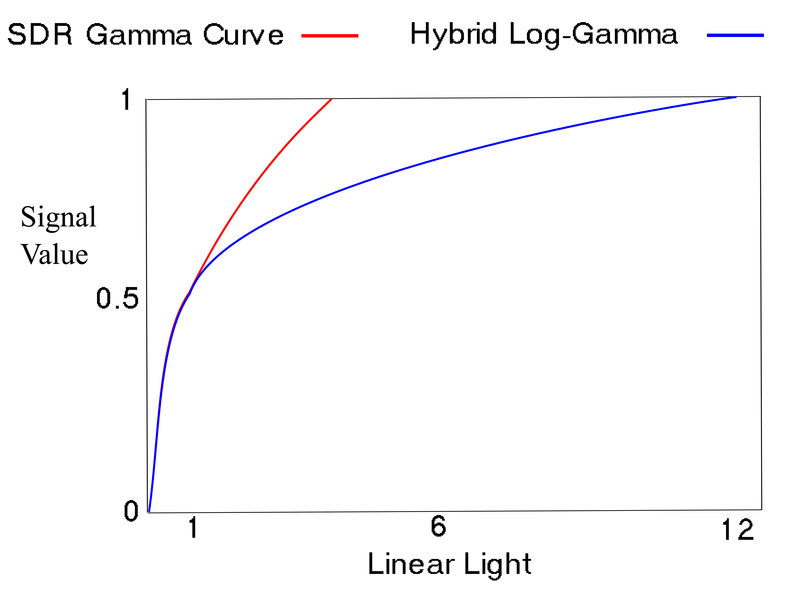 As a gamma curve, the HLG curve is very similar to the broadcast standard Rec. 709 curve from 0–70% (Figure 1, below). HLG gets very aggressive with content that falls above 70% in order to be able to record a larger dynamic range. The current Sony implementation allows for 10–11 stops of exposure, compared to 6 stops in Rec. 709. One aspect of filming and viewing HDR content that initially surprised me—but in fact makes perfect sense—is that regardless of whether you are showing content in HDR or SDR, your main content has the same brightness on the delivery end (Figure 2, below). This is especially true for your talent; you would not expose them in the highlights. This creates challenges when filming with different LOG and Gamma curves because you need to expose differently on the acquisition end of the workflow, depending on the LOG or Gamma curve. In general, when filming with HLG, you should expose a bit darker than you normally would, in order to make sure that you don’t push your talent into the highlight end of the curve where there isn’t as much information recorded per stop. You also won’t be able to do much grading to HLG footage because the slope of the curve changes dramatically from the lows and mids to the highlights. This shouldn’t be a big issue for camera operators and technical directors who are used to producing live content, as they are accustomed to having to nail the exposure for live content already. When it comes to resolution and color bit depth, shooting with HLG is no different than shooting with any LOG or Gamma curve. If your video camera supports 4K UHD only in 8-bit color, then your footage won’t grade as well as HD footage filmed in 10-bit color. Also, most HDR monitors are capable of supporting 10-bit color, so if you output 8-bit color, you’re limiting playback to only 256 values for each of red, blue, and green, instead of 1,024 values with 10-bit. When filming with HLG, it’s especially important not to get stingy with the codec and bitrate choice on the recording end. In fact, you may want to add an external recorder with a DNxHD or ProRes Codec as opposed to the long GOP interframe in-camera codecs your camera supports. Just be very careful about which video output you choose, as the HDMI and HD-SDI outputs on cameras like the Sony FS5 have different maximum resolutions and color bit depth. Choosing a color space can be a bit confusing. When shooting with HLG, you can choose between Rec. 709 and Rec. 2020 color. HDR TVs prefer 2020, and SD monitors prefer 709, so one of your workflows is going to have hue and saturation levels slightly off. If you’re shooting with HLG exclusively for SDR delivery and you want to protect your highlights, use Rec. 709 color. If your shoot requires live HDR delivery, then you might want to use Rec. 2020 color and let the SDR look slightly off. If this doesn’t sound like a perfect workflow, that’s because it isn’t. It is a hybrid workflow with attendant trade-offs. Finally, if you’re delivering SDR live and HDR for later on-demand viewing, you may want to shoot with Rec. 709 color and do some light grading for the HDR version. Alternatively, you might want to consider one of the other LOG or Gamma curves and apply live LUTs. You can also perform a proper color grade for each of your HDR and SDR outputs. At the end of the day, most live producers will need to test each workflow and decide for themselves which one best suits their needs.